Labour's chief whip Nick Brown will not stand for re-election - after new leader Ed Miliband asked him not to. Mr Brown has written to Mr Miliband to confirm he would not enter the ballot, saying whoever did the job had to have the leader's confidence. The chief whip post will be elected by MPs. Nominations close later. Mr Brown was chief whip when Gordon Brown was prime minister. Mr Miliband has said a "new generation" is in charge of Labour. Following his election on Saturday, he has made clear his intention to move on from the New Labour of his predecessors Tony Blair and Gordon Brown. 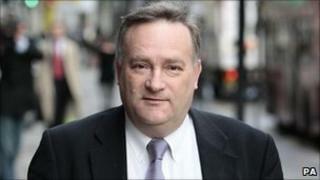 It is understood Mr Miliband met Nick Brown earlier on Wednesday. In a letter, Mr Brown wrote: "As you know I intended to stand for election as chief whip. "During our meeting earlier today you indicated that you wished me not to do so. The chief whip must have the full confidence of the party leader. I fully respect your wishes and will no longer be standing for the position." Mr Miliband thanked him for his work as chief whip but wrote: "As we discussed, the election of a new leader is a time for a fresh start and that's why I am grateful to you for agreeing to step aside as chief whip." The BBC understands that Jim Fitzpatrick, who had expressed an interest in the job, is to withdraw his name and that Ed Miliband has asked Rosie Winterton to stand for the post. Mr Brown was long seen as one of Gordon Brown's most loyal lieutenants and Mr Miliband's actions - effectively sacking Mr Brown - will be seen as another attempt to break from the past, said BBC political correspondent Laura Kuenssberg. He was chief whip at the start of Labour's time in office, before becoming secretary of state for agriculture and a minister in the department for work and pensions. He returned to the position after Gordon Brown became prime minister. The Parliamentary Labour Party has approved changes allowing the chief whip to be elected separately to the rest of the shadow cabinet and to serve a full Parliament. Nominations for the post close, alongside those for 19 other shadow cabinet posts, at 1700 BST on Wednesday.